me. How lucky we are to be living this life of freedom, to do as we wish, to wake up when our bodies and minds wish to. She opens her eyes and gives me a little smile and says, “Bonjour, mon amour.” “Good morning,” I answer, looking into her beautiful face. The continuation of this story can be found in our book The Fortunate Few page 12 Preface. However, ask yourself for a minute; what would it be like, never to wake up to an alarm clock? Perhaps simply allowing yourself to wake up naturally every day or allowing the birds singing or waves from the beach to wake you up? What would it be like to plan your days as you wish, do what you want or better yet just relax. Maybe you’re wondering whether you can attain this kind of freedom. We believe that with a plan and determination and by following the steps to reach your goals, anyone can achieve success. Why not you? We have always been interested in learning about and from people who live their desired lifestyles. We have read many biographies and often make an effort to meet with those who were willing to share their recipes for success and to talk about their motivation. If you decide you will take the necessary steps, commit to them and really apply yourself, you can achieve anything. In our opinion, it takes approximately 10 years to become a true professional at what you do. If you keep your focus and are determined to devote your time and energy for at least 10 years, you will achieve your goals. 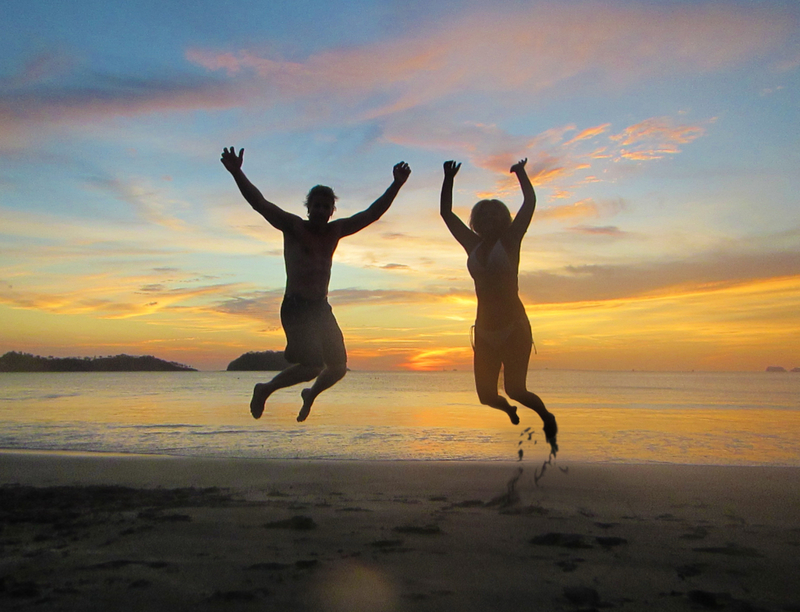 explain in detail how we organized our plan and how we applied it to gain financial freedom, which now allows us to live the lifestyle we desire. We credit our success to planning and to taking action – it takes drive and energy to implement a plan like ours. We aren’t sharing this with you to show off, we simply want to impress upon you how you can also achieve your goals and live the ultimate lifestyle you have always wanted. Friends, family and colleagues often asked how we were able to retire so young and live this amazing lifestyle. When we explained our approach, some suggested we write a book. So we did just that, recognizing that writing a book, coupled with developing a website, would be a great way to help others achieve financial freedom like we did. 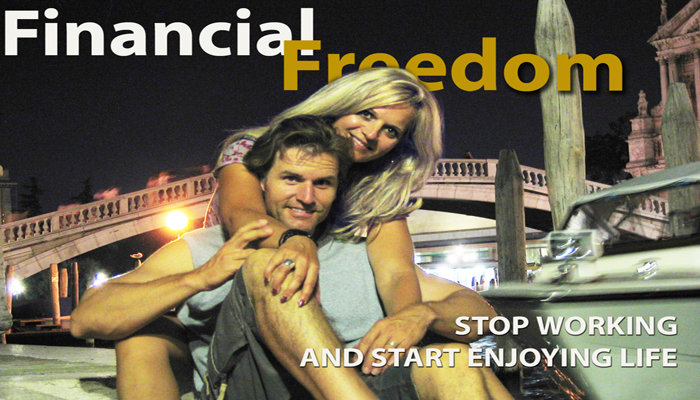 This book offers insight into our own journey to financial independence. We hope you enjoy it and that you also attain all your desires. Please share your success with us, we would love to hear from you. It’s time to be financially free and do what it is you want with your life. My father used to say, it isn’t how much you make that counts. It’s how much you save. There is a lot to be said about that. We know a lot of people making double the income we were making. It is amazing to us that many of them have very little to show for it. They are still working 10 hour days, and can’t seem to get ahead. However, when visiting them, they have a flat screen TV in every room. They have all the latest gadgets. The latest smart phone, ipad, laptops for every member of the family and wow that new surround sound and entertainment room. Two cars on lease, a water craft or RV. However, they are not able to invest but they have all the toys, and then there is the couple making a modest income in the same position. We can’t seem to get rid of our credit card debt one says to me. However, I notice that they eat out at lunch everyday and seem to like shopping. Listen, you’re an adult and you know where the problem lies. I met a janitor that was a millionaire, I also met an auto mechanic that is a multi-millionaire. What these people do is they stay within a set budget and they invest the rest never over extending there spending. Yes, now that they are financially independent they have flat screen TV’s in every room but todays generation wants it all now or nothing. The key here is you will have it all, but you will have nothing at the end. Take responsibility for your actions and think about the future. This is what we want you to consider. Most of you reading this are a couple. So this means there are two incomes coming in. This is what we suggest you do. Take the lesser of the two income. So for example if one of you is making 75,000 per year and the other is making 55,000 per year, we suggest, you live off the 55,000 per year and invest the 75,000 dollar income. I know, it won’t be 75,000 as this income is taxes, so you should be investing approximately 44,000 per year. Some might say, we can’t do that, for those saying this, then don’t. But for those that are saying I can, congratulations as you are on your way in being among the fortunate few. In 10 years, you will experience financial freedom and you will choose to do with your days as you wish. You will be able to look at those that said, we can’t do that and say I did it. Before you start this new way of life. Look at your expenses and together, you and your partner, now decide where to start cutting back. For example, look at your spending habits and start making real change, brown bag your lunches from now on. Yes, that means eating a healthy sandwich or left overs from last nights dinner. Do you really need that entertainment package you spend 100 dollars a month on? No, install an antenna for 200 dollars and satisfy yourself with that. No more cable bills. If you don’t get your favorite TV show that you can’t seem to live without. Well just subscribe to that one series on that AppleTV you barely use and if you don’t have one, see if you can get it online. You have cell phones; do you really need that land line? How about the weekend restaurant, cut that back to once a month or every two months? How about your shopping habits, do you really need that extra sweater when you have 9 already? Just stop shopping all together. Only go when you absolutely need something and only go to purchase that one item. Ok, how about the two cars, do you really need two cars? Maybe, maybe not. Do you smoke? Are you out of your mind, 10 dollars a pack, not to mention your health. Need not say more on that. How about downsizing, we went from a 4 bedroom, 4-bathroom home to a 2 bedroom 1 bathroom. Yikes, talk about change. There are many ways in savings, just do it. Understand neuro-association, I think we will talk about this in our next blog as it is important to link your emotions to the decisions you make. Understanding this will make you follow through on your decisions. Now it is one thing to talk about were to save but how about thinking about where to make money. I rented out a room to a student from a local college. Perhaps you have a basement that you can rent out as extra income. How about, working every Saturday morning for a farmer at a farmer’s market to make an extra 75 dollars and perhaps get free produce. A great way to have fun and get paid, I know from experience as I did it. There are numerous ways in doing this. If you don’t start doing this now, simply surrender to the fact that you will work the rest of your days until 65 and you will then get to enjoy possibly a pension while sitting on your rocking chair. Ok for those that are 65, I’m sorry, I know, you are probably not in a rocking chair but you most probably don’t have the energy and stamina you had when you were 30. And now that you are 65 and over, do you not wish you were in your 30’s or 40’s and retired? If you make a conscious decision in making a real change, you will see how fast things start to progress. You will soon realise wow; we already have a 20% down for an investment property. Just don’t go spending this on a sail boat or a Winnebago. When do you know when you can purchase a luxury car, a sports car, a sail boat or a Winnebago? When you know you can live without working, that your investments generate enough income that you can live the lifestyle you desire and you have enough cash flow above your daily expenses to purchase what it is you want and need. The amazing thing is, if you continue to practice these habits, you will achieve your goals faster than you think possible. 10 years’ flies by and by the time you know it. You will be financially independent, free and among “The Fortunate Few”. You are here reading this article because you’ve finally figured out you want to be financially free. Like us, you want to retire in 10 years or less and give up this working culture we learned so well. You finally realize there is more to life than working 8, 10, 14 hours a day. So let’s talk about financial freedom and what this means. Let’s break down the term “financial freedom”. The word financial relates to money and freedom relates to being independent, that is having the freedom to do as you wish and having enough cash flow to do it. Some also refer to as «financial independence»: Having sufficient personal wealth to live the life you desire without having to hold a regular job. This means you can either dispose of enough money where you can withdraw 1000 dollars a week from your bank account for the rest of your life for example. Still have plenty of money left over or having enough assets generating income to cover your expenses, and more. In this example the person is perhaps receiving dividends from stocks or a MIC (Mortgage Investment Corporation) investment. Being financially independent does not mean your mortgage needs to be paid off. It only means you are generating enough income without working to make your scheduled payments. Obviously, your goal is to have all debts paid off however we will talk about good debt and bad debt in another article. Like we mention in our book, it is time to change the way we think and relate to money. We need to break free from what we were taught and realize there is more to life than work until you reach 65. I know, this only happens in the movies right!? Waking up when you want, doing what you want with your time and your days. Enjoying all the activities you always wanted, when and where you want. Traveling to exotic places or visiting ancient lands, having time to spend with your family, or to simply read as many books as you want. Perhaps you’re a movie buff, or a gamer, or love sports, or always wanted to climb Mount Everest. Well this is possible if you develop a simple 10-year plan and stick to it. We are going to take you through our journey and share what we did with interesting article and stories so that you can join us among the fortunate few. If you’re like most Canadians and Americans, you probably are not where you want to be right now. Most of your working income is going towards debt and you can’t invest to get ahead. This is perhaps your reality and most people are in this situation. The reason for this is because we live basically the way we were taught, that is, go to school, then work hard, pay off your house, work your whole life to pay off debt, retire at 65 and live off of some type of pension. This is BS, sorry for the language but it is. You can retire at 30 if you start at 20, you can retire at 35 if you start at 25 and yes you can retire at 40 if you start at 30. You need to develop a plan that works. Break free from what you were taught. We are living proof to the fact that this can work and there are many others also doing the same. First, start by stopping the blame game, recognize that you blame the government, or you blame the economic situation, your family upbringing or your employment, what ever it is, there is only one person to blame and that is yourself. Change this now and change your ways. Become a regular reader of The Fortunate Few and learn the best practices used by people with financial independence. Start applying them in your life and become The Fortunate Few. Share with us your situation and what you think.